Kissinger’s invaluable and lasting contribution to the history of this crucial time. 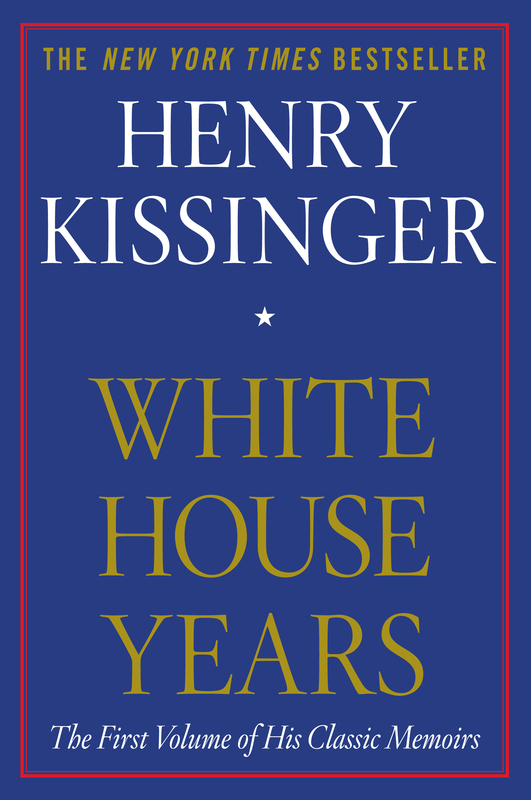 One of the most important books to come out of the Nixon Administration, the New York Times bestselling White House Years covers Henry Kissinger’s first four years (1969–1973) as Assistant to the President for National Security Affairs. Among the momentous events recounted in this first volume of Kissinger’s timeless memoirs are his secret negotiations with the North Vietnamese in Paris to end the Vietnam War, the Jordan crisis of 1970, the India-Pakistan war of 1971, his back-channel and face-to-face negotiations with Soviet leaders to limit the nuclear arms race, his secret journey to China, and the historic summit meetings in Moscow and Beijing in 1972. He covers major controversies of the period, including events in Laos and Cambodia, his “peace is at hand” press conference and the breakdown of talks with the North Vietnamese that led to the Christmas bombing in 1972. Throughout, Kissinger presents candid portraits of world leaders, including Richard Nixon, Anwar Sadat, Golda Meir, Jordan’s King Hussein, Leonid Brezhnev, Chairman Mao and Chou En-lai, Willy Brandt, Charles de Gaulle, and many others. 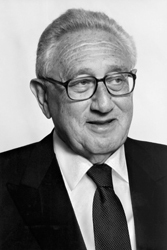 White House Years is Henry Kissinger’s invaluable and lasting contribution to the history of this crucial time. THE Inauguration took place on a bright, cold, and windy day. I sat on the platform just behind the new Cabinet and watched Lyndon Johnson stride down the aisle for the last time to the tune of “Hail to the Chief.” I wondered what this powerful and tragic figure thought as he ended a term of office that had begun with soaring aspiration and finished in painful division. How had this man of consensus ended up with a torn country? Johnson stood like a caged eagle, proud, dignified, never to be trifled with, his eyes fixed on distant heights that now he would never reach. There was another fanfare and President-elect Richard Nixon appeared at the top of the Capitol stairs. He was dressed in a morning coat, his pant legs as always a trifle short. His jaw jutted defiantly and yet he seemed uncertain, as if unsure that he was really there. He exuded at once relief and disbelief. He had arrived at last after the most improbable of careers and one of the most extraordinary feats of self-discipline in American political history. He seemed exultant, as if he could hardly wait for the ceremony to be over so that he could begin to implement the dream of a lifetime. Yet he also appeared somehow spent, even fragile, like a marathon runner who has exhausted himself in a great race. As ever, it was difficult to tell whether it was the occasion or his previous image of it that Nixon actually enjoyed. He walked down the steps and took the oath of office in his firm deep voice. MY own feeling of surprise at being there was palpable. Only eight weeks earlier the suggestion that I might participate in the Inauguration as one of the new President’s closest advisers would have seemed preposterous. Until then, all my political experience had been in the company of those who considered themselves in mortal opposition to Richard Nixon. I had taught for over ten years at Harvard University, where among the faculty disdain for Richard Nixon was established orthodoxy. And the single most influential person in my life had been a man whom Nixon had twice defeated in futile quests for the Presidential nomination, Nelson Rockefeller. It was Nelson Rockefeller who had introduced me to high-level policymaking in 1955 when he was Special Assistant for National Security Affairs to President Eisenhower. He had called together a group of academics, among whom I was included, to draft a paper for the President on a fundamental diplomatic problem: how the United States could seize the initiative in international affairs and articulate its long-range objectives. Rockefeller proved to be true to his word. We wrote a report; one of its ideas, the “open skies” proposal, was accepted. The sections spelling out long-range objectives were stillborn, partly because of the prevailing mood of self-satisfaction in the country, but largely because of the opposition of a powerful Secretary of State pressing his own convictions. At the end of 1955 Rockefeller resigned. I had been part of a typical Rockefeller venture. Of all the public figures I have known he retained the most absolute, almost touching, faith in the power of ideas. He spent enormous resources to try to learn what was “the right thing” to do. His national campaigns were based on the illusion that the way to win delegates at national political conventions was to present superior substantive programs. He spent an excruciating amount of time on his speeches. Untypical as he might seem to be, he was in a way quintessentially American in his boundless energy, his pragmatic genius, and his unquenchable optimism. Obstacles were there to be overcome; problems were opportunities. He could never imagine that a wrong could not be righted or that an honorable aspiration was beyond reach. For other nations utopia is a blessed past never to be recovered; for Americans it is no farther than the intensity of their commitment. Nelson Rockefeller, I am certain, would have made a great President. He possessed in abundance the qualities of courage and vision that are the touchstones of leadership. But at the moments when his goal might have been realized, in 1960 and again in 1968, he uncharacteristically hesitated. In the service of his beliefs he could be cold-blooded and ruthless; he was incredibly persistent. Yet there was in him a profound ambivalence. A kind of aristocratic scruple restrained him from pursuing the prize with the single-mindedness required and led him to exhaust himself in efforts to make himself worthy of the office. His entire upbringing made him recoil from appearing before the people he wanted to serve as if he were pursuing a personal goal; being already so privileged, he felt he had no right to ask anything more for himself as an individual. So he sought the office by trying to present to the nation the most sweeping vision of its possibilities and the best blueprint on how to attain them. In a deep sense Nelson Rockefeller suffered from the hereditary disability of very wealthy men in an egalitarian society. He wanted assurance that he had transcended what was inherently ambiguous: that his career was due to merit and not wealth, that he had earned it by achievement and not acquired it by inheritance. In countries with aristocratic traditions—in Great Britain, for example, until well after World War II—an upper class moved in and out of high office convinced that public responsibility was theirs by right. Merit was assumed. But in the United States, the scions of great families are extremely sensitive to the charge of acquiring power through the visible exercise of influence or wealth; they believe that they must earn their office in their own right. But no more than a beautiful woman can be sure of being desired “for her own sake”—indeed, her own sake is inseparable from her beauty—can a rich man in America be certain what brought him to his station in public life. If he is lucky he learns in time that it makes little difference. In high political office he will be measured by the challenges he met and the accomplishments he wrought, not by his money or the motives of those who helped him get there. History will judge not the head start but the achievement. Nelson Rockeller never fully resolved this dilemma. After his untimely death it was said that he failed to win the Presidency despite the fact that he was a Rockefeller. The opposite was more nearly true. He failed largely because he was a Rockefeller. He was not above spending vast sums for his political campaigns, but at the same time he felt an inordinate obligation to justify his ambition by his programs and an extraordinary reluctance to realize his dreams by what he considered the demeaning wooing of delegates to national conventions. It is not quite the way our political process works, geared as it is more to personalities than to programs. Through three conventions Rockefeller fought for what he considered respectable party platforms in defiance of one of the surest lessons of American political history: that party platforms serve the fleeting moment when delegates come together to choose a party’s candidate and then quietly fade from public memory. In 1960, he advanced a major and comprehensive program a bare three weeks before the Republican National Convention, when his rejection was already foreordained and there was no practical hope of altering the outcome. By this device he forced Nixon into the famous “Compact of Fifth Avenue”—a document drafted in Rockefeller’s apartment—tilting the Republican platform in a direction compatible with his views. But he paid a grievous price in terms of his standing in the party. In 1964, he opposed Barry Goldwater beyond all the dictates of prudence because he was genuinely convinced that Goldwater in those days was a stalking horse for a dangerous form of conservative extremism (though he came to admire him later). And Goldwater’s less temperate adherents reciprocated by seeking to jeer Rockefeller off the stage at the Republican convention. In 1968, he withdrew from the race in March when he still had an outside chance and then, when Nixon had assured himself of a mathematical majority, reentered it by publishing a series of detailed and thoughtful policy positions. The contrast with the style of Richard Nixon could not have been greater. In contemporary America, power increasingly gravitates to those with an almost obsessive desire to win it. Whoever does not devote himself monomaniacally to the nominating process, whoever is afraid of it or disdains it, will always be pursuing a mirage, however remarkable his other qualifications. With candidates for the highest office, as with athletes, everything depends upon timing, upon an intuitive ability to seize the opportunity. Convention delegates live the compressed existence of butterflies. For a brief period they are admired, wooed, pressured, flattered, cajoled, endlessly pursued. The day after they have chosen, they return to oblivion. They are therefore uniquely sensitive to any candidate’s self-doubt. The qualities required to grasp the nomination for the American Presidency from such a transient body may have little in common with the qualities needed to govern; indeed, as the demands of the nominating process become more intensive with each election the two may grow increasingly incompatible. The nominating procedure puts a premium on a candidate skilled at organization, who can match political expression to the need of the moment, a master of ambiguity and consensus, able to subordinate programs to the requirement of amassing a broad coalition. A man who understands the complex essence of the nominating process, as Nixon did so supremely, will inevitably defeat a candidate who seeks the goal by emphasizing substance. As a personality, Nelson Rockefeller was as different from Adlai Stevenson as it was possible for two men to be. Rockefeller was made of sterner stuff; he was far more decisive. And yet their destinies were oddly parallel. In the face of opportunity they hesitated, or rather they disdained to fashion their opportunities by the means required by the new politics. If this was dangerous for a Democrat, it was fatal for a Republican, whose party, having been out of power for a generation, had turned inward to an orthodoxy and discipline that made it highly suspicious of bold new programs. All the frustrations of the two men flowed from this flaw. Just as Stevenson was defeated by the Kennedy organization in 1960, so Rockefeller was defeated by the Nixon machine in 1960 and again in 1968. Rockefeller’s intense dislike of Nixon came from many factors, but crucial was the intuitive rebellion against the politics of manipulation that may yet be the essence of modern American Presidential politics. In addition, the rivalry between Rockefeller and Nixon was not without an ingredient of personal antipathy that transcended even that automatically generated by competition for a unique prize. Nixon thought of Rockefeller as a selfish amateur who would wreck what he could not control, a representative of the Establishment that had treated him with condescension throughout his political life. Rockefeller considered Nixon an opportunist without the vision and idealism needed to shape the destiny of our nation. In 1968 I shared many of these attitudes toward Nixon, although I had little direct evidence on which to base a judgment. I attended the gallant press conference in which Rockefeller conceded to Nixon and I was sick at heart. My feelings were very similar to those of a journalist who had covered the Rockefeller campaign and who broke down in the bar of the Americana Hotel when it came to an end. “This is the last politician to whom I will become emotionally attached,” he said. “Politicians are like dogs. Their life expectancy is too short for a commitment to be bearable.” A man who could have been one of our great Presidents would never achieve his goal. This knowledge was all the harder for his friends because we knew deep down that but for tactical errors and hesitations, it should have been otherwise. SOME months after that depressing day—with Richard Nixon now President-elect—I was having lunch with Governor Rockefeller and a group of his advisers in New York City in his small apartment on the fourth floor of the Museum of Primitive Art. It was Friday, November 22, 1968. The museum, which he had endowed, was connected with Rockefeller’s gubernatorial office on West Fifty-fifth Street by a covered walkway traversing a back alley. The apartment had been designed by the architect Wallace Harrison, who had also built Rockefeller Center. Its dramatic curved walls done in red were covered with pictures by Toulouse-Lautrec; invaluable paintings which he had no room to hang were stored in closets. In this splendid setting we were discussing what attitude Rockefeller should take toward a possible offer to join the Nixon Cabinet and what Cabinet position he should seek if given a choice. Views were divided. One group of advisers held that Rockefeller’s influence would be greater as governor of a major state controlling a political party organization and patronage. Others considered indirect influence illusory. A governor could scarcely sway national policy consistently or across the board, and any attempt to do so was likely to reopen old wounds in especially unfavorable circumstances. Rockefeller leaned toward the first opinion, arguing that he would find it difficult to serve as a subordinate, especially to Nixon. I was of the view that if given the opportunity Rockefeller should join the Cabinet; I further urged that he would be happiest as Secretary of Defense. I thought that the President-elect would almost surely carry out his announced intention to act as his own Secretary of State. The State Department, moreover, did not seem to me to offer the autonomy required by Rockefeller’s personality. As Secretary of Defense he would be able to implement his decades-long interest in national security. From the example of Robert McNamara, I thought also that the Secretary of Defense could play a major role in the design of foreign policy. We were debating these considerations in a desultory fashion when we were interrupted by a telephone call from the office of the Presidentelect. It was a poignant reminder of Rockefeller’s frustrating career in national politics that the caller was Nixon’s appointments secretary, Dwight Chapin, who was interrupting Rockefeller’s strategy meeting to ask me—and not Rockefeller—to meet with his chief. In retrospect, it is clear that this phone call made our discussion pointless. But we returned to it as if nothing had happened. No one at the lunch could conceive that the purpose of the call could be to offer me a major position in the new Administration. The call filled me with neither expectation nor enthusiasm. During my long association with Rockefeller, I had served as a consultant to the White House in the early days of John Kennedy’s Administration, when professors for the first time moved from advisory to operational responsibilities. President Kennedy, who had read my newly published book, The Necessity for Choice (or at least a long review of it in the New Yorker), asked me to join the White House staff. We had a long conversation in which I was charmed by Kennedy’s vitality and his incisive mind, although at that early stage it did not seem to me that Kennedy’s self-confidence was as yet equal to his energy and soaring imagination. Nor did I have the impression that his Special Asistant for National Security, my former Harvard colleague McGeorge Bundy, shared the President’s sense of urgency to add to the White House staff another professor of comparable academic competence. In any event I was reluctant to sever my connection with Rockefeller, so we agreed that I would spend a day or two a week at the White House as a consultant. The very nature of an outside consultancy, and my own academic self-centeredness, as yet untempered by exposure to the daily pressures of the Presidency, combined to make this a frustrating experience on all sides. A regular consultant is too remote to participate in fast-moving decisions, and yet too intimately involved to maintain the inward distance and mystery of the outside adviser. He becomes almost inevitably a burden alike upon those who must assist him and those whom he advises. With little understanding then of how the Presidency worked, I consumed my energies in offering unwanted advice and, in our infrequent contact, inflicting on President Kennedy learned disquisitions about which he could have done nothing even in the unlikely event that they aroused his interest. It was with a sense of mutual relief that we parted company in mid-1962. WITH this unpromising background I had even less reason to expect to be invited to join the Nixon Administration. I did not know the President-elect. My friend William F. Buckley, Jr., the conservative columnist, had told me for years that Nixon was underestimated by his critics, that he was more intelligent and sensitive than his opponents assumed. But I had no opportunity to form my own judgment until after the 1968 election. I had met Richard Nixon only once, when we both attended a Christmas party in Clare Luce’s apartment in 1967. Nixon arrived just as I was about to leave. Mrs. Luce drew us into the library. Nixon said that he had read my first book, Nuclear Weapons and Foreign Policy. He had learned from it and had written me a note about it, which to my embarrassment I had forgotten. I replied stiffly, less out of the prejudice of two decades than from the awkwardness of our meeting. At that time I was still highly uncomfortable with small talk, and Richard Nixon has to this day not overcome his own social inhibitions. We exchanged a few strained pleasantries and went our separate ways. My first encounter with the Nixon staff occurred at the Republican Convention in Miami in 1968. Before the balloting but after Nixon’s nomination had become obvious, I met with Richard V. Allen, then Nixon’s principal adviser on foreign policy, to try to reach agreement on a Vietnam platform that would avoid a convention fight. My major concern was to make sure that the Republican platform took account of the hopes for a negotiated settlement. With the nomination assured, the Nixon forces saw no point in the kind of bruising battle over substance that had marred the previous two conventions. A rather bland compromise emerged, which we in the Rockefeller camp—with little enough to celebrate—welcomed as a moral victory. After the convention I returned to Harvard, my contribution to the American political process completed, I thought. During the national campaign in 1968 several Nixon emissaries—some self-appointed—telephoned me for counsel. I took the position that I would answer specific questions on foreign policy, but that I would not offer general advice or volunteer suggestions. This was the same response I made to inquiries from the Humphrey staff. In any event, only one question was ever put to me by the Nixon organization. Early in October 1968, Bill Buckley introduced me to John Mitchell, then Nixon’s campaign manager. Mitchell asked me if I thought the Johnson Administration would agree to a bombing halt in Vietnam in return for the opening of negotiations before the election. I replied that it seemed to me highly probable that the North Vietnamese wanted a bombing halt on these terms, and that they would seek to commit both candidates to it. Therefore I believed that Hanoi was likely to agree to it just before the election. I advised against making an issue of it. Mitchell checked that judgment with me once or twice more during the campaign. At one point he urged me to call a certain Mr. Haldeman if ever I received any hard information, and gave me a phone number. I never used it. My limited impression of the Nixon staff was of a group totally immersed in the mechanics of the election, deferring issues of substance until the campaign was over, a not uncharacteristic attitude for the staff of any Presidential contender. IN response to Chapin’s phone call, I presented myself at ten o’clock on the morning of Monday, November 25, at the Nixon transition headquarters on the thirty-ninth floor of the Pierre Hotel, not knowing what to expect. I did not anticipate a conversation that would change my life; I thought it likely that the President-elect wanted my views on the policy problems before him. Clean-cut young men were monitoring security cameras in the reception area, where I was greeted by one of the cleanest-cut and youngest, who turned out to be Dwight Chapin. With firm politeness, he took me to a large living room at the end of the hall and told me that the President-elect would be with me soon. I did not know then that Nixon was painfully shy. Meeting new people filled him with vague dread, especially if they were in a position to rebuff or contradict him. As was his habit before such appointments, Nixon was probably in an adjoining room settling his nerves and reviewing his remarks, no doubt jotted down on a yellow tablet that he never displayed to his visitors. When at last Nixon entered the room, it was with a show of jauntiness that failed to hide an extraordinary nervousness. He sat on a sofa with his back to the window overlooking Fifth Avenue, and motioned me to an easy chair facing him. His manner was almost diffident; his movements were slightly vague, and unrelated to what he was saying, as if two different impulses were behind speech and gesture. He spoke in a low, gentle voice. While he talked, he sipped, one after another, cups of coffee that were brought in without his asking for them. His subject was the task of setting up his new government. He had a massive organizational problem, he said. He had very little confidence in the State Department. Its personnel had no loyalty to him; the Foreign Service had disdained him as Vice President and ignored him the moment he was out of office. He was determined to run foreign policy from the White House. He thought that the Johnson Administration had ignored the military and that its decision-making procedures gave the President no real options. He felt it imperative to exclude the CIA from the formulation of policy; it was staffed by Ivy League liberals who behind the facade of analytical objectivity were usually pushing their own preferences. They had always opposed him politically. Nixon invited my opinion on these subjects. I replied that he should not judge the Foreign Service’s attitude toward a President by its behavior toward a candidate or even a Vice President. In any event, a President who knew his own mind would always be able to dominate foreign policy. I knew too little about the CIA to have an opinion. I agreed that there was a need for a more formal decision-making process. The decisions of the Johnson Administration had been taken too frequently at informal sessions, often at meals—the famous “Tuesday lunches”—without staff work or follow-up. It was therefore difficult to know exactly what decisions had been made. Even with the best of goodwill, each interested agency was tempted to interpret the often ambiguous outcome of such meetings in the way most suited to its own preconceptions. And, of course, there was a high probability of outright error and misunderstanding. There was little opportunity for conceptual approaches, consecutive action, or a sense of nuance. A more systematic structure seemed to me necessary. It should avoid the rigorous formalism of the Eisenhower Administration, in which the policymaking process had too often taken on the character of ad hoc treaties among sovereign departments. But a new coherence and precision seemed to me essential. Nixon outlined some of his foreign policy views. I was struck by his perceptiveness and knowledge so at variance with my previous image of him. He asked what in my view should be the goal of his diplomacy. I replied that the overriding problem was to free our foreign policy from its violent historical fluctuations between euphoria and panic, from the illusion that decisions depended largely on the idiosyncrasies of decision-makers. Policy had to be related to some basic principles of national interest that transcended any particular Administration and would therefore be maintained as Presidents changed. At this point the conversation grew less precise. Nixon’s fear of rebuffs caused him to make proposals in such elliptical ways that it was often difficult to tell what he was driving at, whether in fact he was suggesting anything specific at all. After frequent contact I came to understand his subtle circumlocutions better; I learned that to Nixon words were like billiard balls; what mattered was not the initial impact but the carom. At this first encounter I had no choice except to take the President-elect literally. What I understood was that I had been asked whether in principle I was prepared to join his Administration in some planning capacity. I replied that in the event that Governor Rockefeller was offered a Cabinet post, I would be happy to serve on his staff. The President-elect made no further comment about my future. He suggested that I put my views about the most effective structure of government into a memorandum. In retrospect it is clear that my comment killed whatever minimal prospects existed for a Rockefeller appointment. Richard Nixon had no intention of having me join his Administration on the coattails of Nelson Rockefeller; even less was he prepared to create a situation in which I might have to choose between the two men. One of my attractions for Nixon, I understood later, was that my appointment would demonstrate his ability to co-opt a Harvard intellectual; that I came from Rockefeller’s entourage made the prospect all the more interesting. To indicate that the conversation was drawing to a close, Nixon pressed a buzzer; a trim, crew-cut, businesslike man appeared and was introduced as Bob Haldeman. Nixon told Haldeman to install a direct telephone line to my office at Harvard so that the President-elect could continue the conversation later. Haldeman jotted down this curious request, which presupposed the absence of normal telephone connections between New York and Cambridge, on a yellow pad. He never made any effort to implement it. As I left the President-elect, I had no precise idea of what he expected of me. From the conversation it was unclear whether Nixon wanted advice or commitment and, if the latter, to what. On my way out Haldeman asked me to step into his office, which was next to Nixon’s. He said nothing to enlighten me on my basic question and I did not ask. Instead, Haldeman seemed eager to describe his job to me. Matter-of-factly he explained that his principal function was to prevent end-runs. He would see to it that no memorandum reached the President without comment from the appropriate White House staffer, and that a member of that staff would be present at every conversation with the President, to guarantee implementation. He also pointed out that he was changing the title of senior White House personnel from “Special Assistant to the President” to “Assistant to the President,” since no one knew what the “Special” meant. Having delivered himself of these pronouncements in a manner which did not invite comment, Haldeman cordially bade me goodbye. I returned to Harvard that afternoon in time to teach my four o’clock seminar on National Security Policy. There was a general buzz of interest at my having seen the President-elect, but no serious speculation that I might be offered an appointment in the new Administration. No newspapers inquired about the meeting and few friends seemed interested. The next day I received a phone call from Nelson Rockefeller. He had seen the President-elect and been informed that he could be of greater service to the country as Governor of New York than as a Cabinet member. Because of the crucial elections to be held in 1970, Nixon had said, it was essential that Rockefeller continue to head the state ticket. Nixon had asked him many questions about me, especially about my performance under pressure. Rockefeller told me that he had fully reassured the President-elect on that point. Rockefeller recounted his conversation blandly, without comment; he expressed no opinion as to whether I should serve under Nixon. An hour later I received a second phone call. This was from John Mitchell’s office, suggesting an appointment for the next day; the subject was to be my position in the new Administration. It was not explained what position he was talking about, whether he thought that I had already been offered one, or whether there would be simply another exploratory talk. I went to New York that evening and called on McGeorge Bundy, who after leaving the White House had become head of the Ford Foundation. Bundy and I had had an ambivalent relationship over the years. I admired his brilliance even when he put it, too frequently, at the service of ideas that were more fashionable than substantial. I thought him more sensitive and gentle than his occasionally brusque manner suggested. He tended to treat me with the combination of politeness and subconscious condescension that upper-class Bostonians reserve for people of, by New England standards, exotic backgrounds and excessively intense personal style. On balance, I held Bundy in very high esteem. Had he lived in a less revolutionary period his career might well have rivaled that of his idol Henry Stimson, whose autobiography he had edited. Bundy would have moved through the high offices of government until his experience matched his brilliance and his judgment equaled his self-confidence. It was Bundy’s misfortune to begin governmental service at a time of upheaval within the very institutions and groups that should have served as his fixed reference points. He was thus perpetually finding himself on the fashionable side, but at the very moment that fashion began to wane. A hawk on Vietnam, he was baffled by the demoralization of the Establishment whose maxims had produced the war; at heart he was a conservative whose previous associations had driven him into causes for which, ultimately, he had no passion. Torn between his convictions and his instincts, between his intelligence and his need for emotional support, Bundy gradually lost the constituencies that could have made him a kind of permanent public counselor like John McCloy or David Bruce; he surely possessed the brilliance, character, and upbringing to render the nation greater service than destiny has so far permitted him. So high was my regard for Bundy that he was the only person I consulted before my meeting with Mitchell. I told him that I expected to be offered a position in the State Department. Bundy’s estimate of the appropriate level for me was reflected in his remark that it would be unfortunate if the President-elect were to appoint Assistant Secretaries before designating the Secretary of State. The Kennedy experience showed, he said, that this procedure undermined the authority of the Secretary without increasing the influence of the President. Bundy urged that, if given a choice, I should seek the position of Director of the Policy Planning Staff, provided the Secretary of State was someone whom I knew and trusted. He expressed no strong objection in principle to my joining the Nixon Administration. “Oh, Jesus Christ,” said Mitchell, “he has screwed it up again.” Mitchell rose from his swivel chair and lumbered out of the room. He returned in five minutes with the information that the President-elect wished to see me, and he escorted me down the hall. This time it was clear what Nixon had in mind; I was offered the job of security adviser. The President-elect repeated essentially the same arguments he had made two days earlier, emphasizing more strongly his view of the incompetence of the CIA and the untrustworthiness of the State Department. The position of security adviser was therefore crucial to him and to his plan to run foreign policy from the White House. We talked briefly about the work. I emphasized that in all previous advisory roles I had refused to see the press. The President-elect readily agreed that I should continue my reticence. Neither of us proved especially far-sighted in this regard. I did not have to remind myself that this was still the same Richard Nixon who for more than two decades had been politically anathema, and for that reason, if for no other, I felt unable to accept the position on the spot. I told the President-elect that I would be of no use to him without the moral support of my friends and associates—a judgment that proved to be false. I asked for a week to consult them. This extraordinary request reflected to no small extent the insularity of the academic profession and the arrogance of the Harvard faculty. Here was the President-elect of the United States offering one of the most influential positions in the world to a foreign-born professor, and that professor was hesitating so that he might talk to colleagues who, to a man, had voted against Nixon and were certain to oppose him in the future. The President-elect was taking a perhaps enormous political risk; the prospective adviser was reluctant to hazard the esteem of his academic associates. Nixon would have been well justified had he told me to forget the whole thing. Instead, he accepted the delay with better grace than the request deserved. Rather touchingly, he suggested the names of some professors who had known him at Duke University and who would be able to give me a more balanced picture of his moral standards than I was likely to obtain at Harvard. He added that he would be delighted if I would regularly bring intellectuals to the White House to ensure that we had before us the widest range of ideas. He had a particularly high regard for men like Alastair Buchan from the United Kingdom and Raymond Aron from France. Immediately after this meeting I began my canvass of friends and colleagues. Unanimously they urged me to accept. Their advice was, undoubtedly, tinged by the desire to know someone of influence in Washington who could provide the vicarious access to power that had become the addiction of so many academics in the aftermath of the Kennedy years. There and then were sown the seeds of future misunderstandings. Some friends and colleagues may have seen in our relationship not only a guarantee of access but also an assurance that their views would prevail. But this was impossible, for two reasons. The wary antagonism between Nixon and the intellectuals did have a profound basis in both philosophy and personality. Nixon did not really trust them any more than they accepted him; they could occasionally coexist, never cooperate. And although I respected my colleagues and liked many of them, as a Presidential Assistant my loyalty was bound to be to my chief whose policies I, after all, would have a major share in forming. As time went on, this difference in perspective was to cause much anguish to both sides. The decisive conversation was with Nelson Rockefeller. I had no choice, he said. Such a request was a duty. To refuse would be an act of pure selfishness. If I rejected the offer I would blame myself for every failure of foreign policy and indeed I would deserve severe criticism. Late Friday afternoon, November 29, a week after receiving that first phone call in Rockefeller’s dining room and two days after being offered the position, I called Nixon’s adviser Bryce Harlow and asked him to convey to the President-elect that I would be homored to accept. The announcement was set for Monday, December 2, at 10 A.M. Thus it happened that the President-elect and I mounted the podium in the ballroom at the Pierre Hotel for what proved to be my first press conference. As usual Nixon was nervous, and in his eagerness to deflect any possible criticism he announced a program substantially at variance with what he had told me privately. His Assistant for National Security would have primarily planning functions, he said. He intended to name a strong Secretary of State; the security adviser would not come between the President and the Secretary of State. The security adviser would deal with long-range matters, not with tactical issues. I confirmed that this reflected my own thinking and added that I did not propose to speak out publicly on foreign policy issues. But the pledges of each new Administration are like leaves on a turbulent sea. No President-elect or his advisers can possibly know upon what shore they may finally be washed by that storm of deadlines, ambiguous information, complex choices, and manifold pressures which descends upon all leaders of a great nation.